How Facebook Live is Disrupting Social Media Marketing For the Better – And How to Use It! Business is forever changing and developing. New technology and ways of communicating and doing business are always emerging, changing the way you speak to customers, advertise your business and sell your product. New products and changes to your service aren’t always welcome and can have a bad response, which is why knowing what your customers want is very important. Coming now is the time of social media. Slowly over time social media apps like Facebook, Twitter, Snapchat and Instagram have taken over a significant portion of people’s free time. Initially these were all just social platforms where people shared lol cats and funny videos. Now they have developed into much more. So many people have a handful of social media apps, many of these people spend a fair amount of time using these social media apps and sites, so it did not take long for businesses to realize that these would be ideal platforms to advertise themselves and reach their customers. The effectiveness of showing a product on a platform like Facebook far outweighed many other local advertising options, the number of views and likes of a single post far outweighs the advertising you might get from a sign outside the front of your business or a newspaper ad. People can tag friends, share the add and comment, giving you a response from the market as to how well your product or business is perceived. There was a time when businesses wouldn’t consider having something like a Facebook page, it could be perceived as unprofessional, which is where sites like LinkedIn emerged. The idea of a business not having and using a Facebook profile now seems mad. Many businesses employ Social Media Managers and agencies to represent them online, advertising their company and products, dealing with comments and queries online and engaging customers. 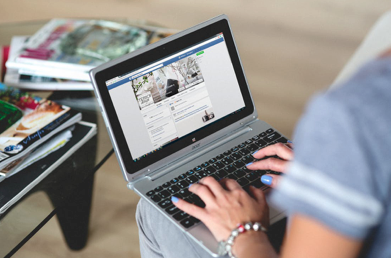 Having a Facebook page for your business means that people all over the world can see what you are about and what you can offer, granting you new business you never expected and getting you recognized. Facebook Live is a feature which now allows you to share a live video directly onto Facebook, whenever you like for as long as you like. People can watch it live, or can watch the video from the beginning if they missed it or joined late. The features of Facebook live make it very easy to use, even with just a phone and allow anyone watching to ask questions, react to the video with likes and dislikes and share your video with their friends. Well let me give you an example of how this can be helpful to you. Say that you are launching a new product, you’ve posted some photos and ideas of the product and received a bit of feedback online, but you are unsure how interested or excited people are for the product. You can tell people that you are planning to unveil this new product with a live stream at a certain time and invite them to join you. You can create a prototype, or show off the first complete product with a live video, showing how it looks, what it does and so that people can see what they are buying. Using the live video, you can show your potential customers what they are buying, you can see how many people are interested by the amount of viewers. Even better you can see what people are saying about your product as you conduct the video, giving you the chance to answer their questions and explain more about it there and then. Another great feature is that throughout the video people watching can react to what they are seeing, liking or disliking certain visuals, features and details of the product. You can then see what people like about your product and what you may need to potentially change. 1. Host a Q&A or Interview live – If you want to try to get more understanding of what you and your company provide and do to your customers then this can be a great way to engage them. Making an event out of a question and answer session or an interview with yourself or one of your employees, can draw people in to learn more about what you do. You can set a time for the video to start do a brief introduction, set a topic or just open yourself up to questions. Viewers can react to your responses, ask questions and you can react to it all live. There is a definitely an appeal to many of seeing a live interview, where they can interact with the information and engage with you regarding the information. 2. Events – Use Facebook to tease an upcoming event, test the waters of you event and how excited people are to be there or see it. Building up anticipation for the event will build a lot of interest and draw more viewers for the live cast. Then you can stream the event you are hosting to people that couldn’t make it, or may be considering to give it a try another time. The live video allows you to respond to questions and see the reactions of the viewers, so you know what people are interested in for future development. This means people that couldn’t make it don’t miss out and allows people to see what the event is all about, how great it is and can encourage them to attend in future. 3. Stream your place of business – Whatever product or service you offer, it can be hard to convey how your company works and the kind of people in your business. A nice way to introduce your business or explain how day to day life in your business works, is to stream it live. This can get a very positive response online. The live video makes it more genuine than a per-recorded video or some pictures. It shows you are an open, modern, friendly business and can introduce many new or old customers into how you do what you do. This can rally a lot of interest if many people don’t understand how your product is made or how your service is provided and can show how well your operation is set up to provide this. 4. Customer Care – If your customer service team comes across a repeated question, you can use a live event to address this, or several questions. This is far more effective than repeatedly answering the same question to each individual customer time after time. The live stream will give customers the chance to understand the explanation with visual aids rather than a reply by letter or email. They will feel more engaged and if any further explanation is needed or if you have to expand of a specific topic, they get their answer there and then. It can be easy to get carried away with all the potential of Facebook Live and the excitement of your team and customers, but don’t rush into a live stream unprepared. Although the lure of a live stream is that it is more organic than a per-prepared video, you still need to be ready for any surprises that may pop up. Make sure you or whoever is in the stream, knows what they are talking about and can answer any questions that come up. Set a topic. Don’t just make a stream, if there isn’t something for you to talk about, introduce or explain then the stream can become awkward if people don’t know what to ask and you don’t know what to talk about. Having a topic or event will drive more interest and give you something to fall back to if it goes quiet or you lose track of what you were saying. Video quality is very important. Although you can do a live stream on your phone or iPad anywhere you have signal, this isn’t necessarily a great idea. Make sure there is good lighting and audio where ever you are. You don’t want noisy machines or wind drowning you out. Using any of this advice in the right way can soon help you utilize your business through Facebook Live in no time, getting you feedback and advertising you would never have had access to before.